AUSTIN, Texas – It’s salty, yet subtle, green, and crunchy. It has more calcium than milk, more potassium than a banana, and more iron than beef. And with new technologies that speed its transition from a health supplement to a widely accepted food, microalgae could play a critical role in feeding a rapidly expanding global population. The world will have to feed two billion more people by 2060 by producing a staggering 70 percent more food. Alexander Mathy, a food technologist at the Institute of Food, Nutrition, and Health at ETH Zurich, and other researchers studying microalgae explained why these tiny photosynthetic cells could be the solution during a Feb. 18 session at the American Association for the Advancement of Science (AAAS) annual meeting. If current consumption patterns continue, in just over 40 years the food system will support a mere 5.4 billion people – much less than today’s population, according to the United Nations’ Food and Agriculture Organization and ETH Zurich university’s Institute of Food, Nutrition, and Health. To determine the actual operating cost to produce one kilogram of algae, researchers have developed a system that determines patterns of electricity use, light intensity, and social factors, such as attitudes towards eating algae and demand for foods grown by local farmers. Maria Barbosa, director of AlgaePARC, a multidisciplinary research program, and microalgae biotechnologist at Wageningen University in the Netherlands led this effort. “It is a tool to look what are the patterns that most impact in order to create a viable process,” she said during the presentation at the AAAS annual meeting. EnerGaia’s design looks like a large plastic rainwater collection bin with a cone-shaped lid. The lid keeps the elements out and the transparent plastic allows sunlight to reach algae on all sides. Bubbles pumped in through bottom ensure that carbon dioxide is evenly distributed. The simple technology encourages farmers to readily implement the system, which is essential for community adoption. The algae chip, green and salty, that Noon-Song provided attendees at the AAAS meeting was made from Spriulina, a highly nutritious blue-green alga already sold worldwide and recognized for its nutritional properties. The chip was grown in a bioreactor on the roof of a hotel in Bangkok and produced locally. And it is only the beginning. 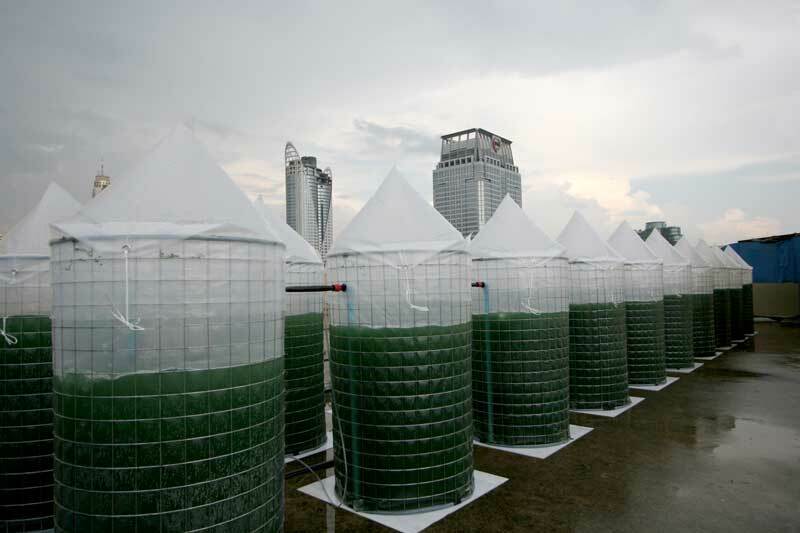 Algae are a promising supplement to an increasingly sustainable and efficient food system that will need to feed the world’s growing population.